Flowers 10-40 or more, blue-purple, ¾–1¼” across [2.5–5 cm]; 5 sepals petal-like, spreading, the upper one with a long nectar-bearing spur behind; upper 2 petals white, the lower 2 blue; numerous stamens hidden by the lower 2 petals, whose tips are moderately split; leaves mainly on stem, 4–8″ across [10–20 cm], narrowly palmately lobed and/or compound; 2–5′ tall [70–150 cm]. Habitat: Moist forest or rarely in moist subalpine meadow, coastal WA and OR, conspicuous along the scenic highway in the Columbia Gorge in April. 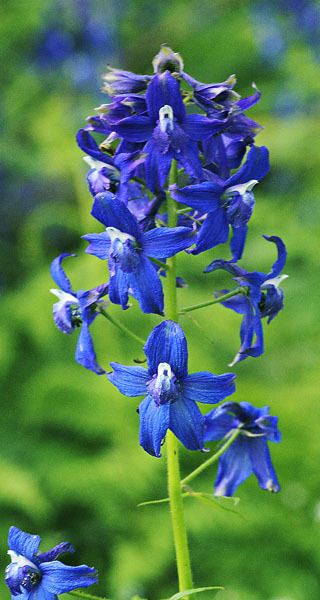 Similar: Of the several other larkspurs with intense indigo flowers, only Menzies Larkspur (Delphinium menziesii) is common in the western Columbia Gorge. Found mainly in the sunny “hanging gardens” well above the Gorge floor, it is relatively small and delicate. Natural History: Though lethal only when eaten in large quantities, larkspurs have killed more cattle than any other western genus. The seeds have for millennia been ground up to poison lice.